TxT Fighter :: No 1 Texting Game! It’s the fighting game with a twist in it’s tail! This unique Text-‘em-Up is frantic-fun and improves your typing skills! Brawl against your friends in multiplayer VS Mode! He who types fastest and most accurately wins! 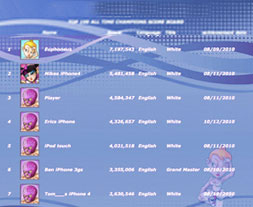 With 7 unique super characters and 6 beautiful, animated stages in arcade mode (plus one secret stage), 2 awesome mini games, loads of achievements and unlockables, and live head to head action over Bluetooth connection, TXT FIGHTER offers huge play-time. TXT Fighter is MADE for the soft keyboard of the iPhone and iPod Touch. TXT Fighter comes with a self-explanatory How-To as well as full Crystal integration that provides players with social networking capabilities (Facebook and Twitter) as well as challenges, leaderboards and achievements. Check out the introduction of the characters with links to the Story Line and their Facebook profiles!